Made with just three main ingredients, these creamy chocolate truffles can be customized with your favourite coatings. They make gorgeous edible gifts, too! Microwave chocolate in large microwaveable bowl on HIGH 2 min. or until chocolate is almost melted; stir until completely melted. Add dry jelly powder; stir 2 min. until completely dissolved. Cool to room temperature. Gently stir in Cool Whip. Refrigerate 2 hours or until mixture is firm enough to handle. 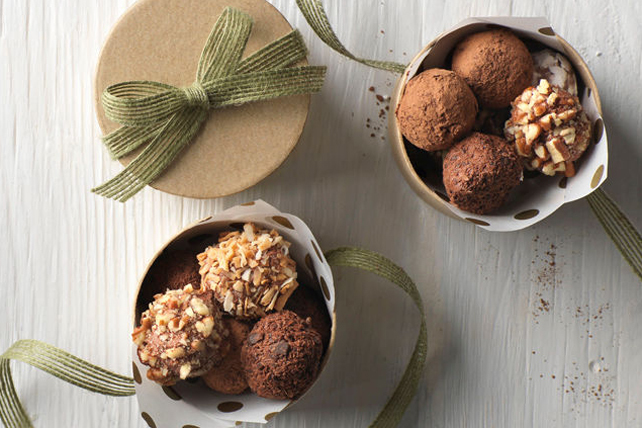 Roll chocolate mixture into 66 (1-inch) balls; place on parchment-covered baking sheets. Refrigerate 1 hour. Working with a few balls at a time, roll in nuts until evenly coated. Use a melon baller to portion the chocolate mixture for each truffle. Truffles do not need to be perfectly round and smooth - a slightly rough appearance is considered typical. For variety, coat truffles with one or more of the following: grated Baker's Semi-Sweet Chocolate, unsweetened cocoa powder, toasted flaked coconut, icing sugar or coloured sprinkles. Truffle mixture softens quickly when rolling, so only remove about 1 doz. truffles from refrigerator at a time. If truffles soften too much to roll, return them to refrigerator to chill until firm.